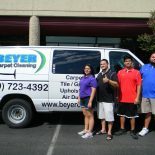 Beyer Carpet Cleaning San Antonio is a reputable, reliable, on time carpet cleaning San Antonio. Our business doesn’t grow unless we are reputable, reliable, and time for our customers. With Beyer Carpet Cleaning you can look us up on-line and find reviews left by our customers. We have several 5 star reviews on Google, Yahoo, Kudzu, and other sites. Our reputation is why our customers come back and why new customers use us. Beyer Carpet Cleaning is reliable because when we say we are going to be there we will. When you call us we tell you up front what the price will be and what service you will received from us. We do not hide information or have any hidden fees. We do not change our story when we arrive to your home. Beyer Carpet Cleaning is on time. We have a one hour window of arrival time. Our technicians call the customer if he will be later than the the expected time. Beyer Carpet Cleaning San Antonio is therefore reputable, reliable, on time for our customers. We specialize in carpet cleaning, tile and grout cleaning, and upholstery cleaning. No matter the service Beyer Carpet Cleaning is reputable, reliable, on time. Our carpet cleaners are safe for you and your family. We will make your carpets look like new when we are done. Our tile and grout cleaning is a process and hard work but we will restore your tile and grout to it’s original state. We clean most types of upholstery and can remove spots, stain, and odors. Your upholstery will look clean and welcoming. Beyer Carpet Cleaning will strive to always be a reputable, reliable, on time carpet cleaning San Antonio. We put our customers first and would love to earn your business every time you need carpet cleaned, tile and grout, and upholstery cleaned.